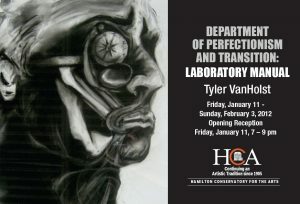 Tyler VanHolst is a local fine artist working in Hamilton for 6 years. Tyler works primarily with charcoal and painting with watercolour and ink. He graduated with his Bachelor of Arts at Redeemer University College in 2011. Tyler's interest in anatomy and the human figure stem from his understanding and experience in mental health and psychology. His primary objective is to reveal the relationships between mental and physical aspects of the body and how psychology can manifest itself and affect common human function.